Perhaps the least intuitive aspect of the Bitcoin network is the proof-of-work concept it uses to define the requirement for the generation of a new set of transactions (“block“) to be added to the distributed transaction database (“block chain“). This concept, which grew out of ideas from the early cypherpunk movement1, is new to monetary theory and feels a little out of place in computer science too. I will show that biology gives us the most suitable framework for understanding it. Although the purpose of the mining computers is to do the accounting for the block chain, most of the work they actually do is to search for good nonces, rather than anything to do with accounting. The energy used to find the nonces is lost forever. The energy does not “back” the value of bitcoins in the way that gold backs an honest bank note, as some have supposed. Of the vast computing power that goes into bitcoin mining, all but a tiny fraction is apparently purposeless. 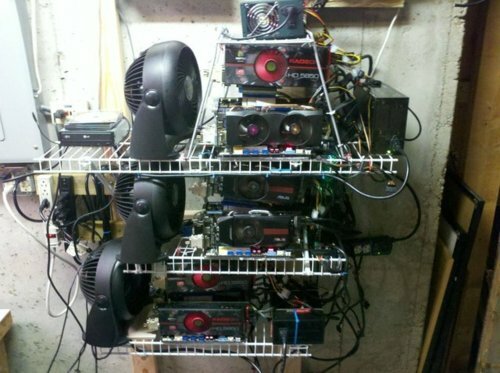 When a person upgrades their mining computer, they mine at a faster rate and therefore earn more bitcoins. However, when everyone upgrades, the mining does not become more efficient as a whole. There is only supposed to be one new block every ten minutes regardless of how hard the network is working. Instead, the network updates the difficulty to require more stringent conditions for future blocks. All miners may work harder, but none is better off. It is rather like a forest, in which every tree tries to grow as tall as possible so as to capture more light than its fellows, with the end result that most of the solar energy is used to grow long, dead trunks. Why tie each bitcoin block to a difficult Procrustean bed? The correct way of thinking about the proof-of-work concept is as a means for a group of self-interested people, none of whom is subordinate to any other, to establish a consensus against a considerable incentive to resist it. Bitcoin could operate perfectly well without proof-of-work, as long as everyone was perfectly honest and altruistic. If they are not, then reaching a consensus is difficult. Before a new block is generated, there might be many payments floating around the network and there is not yet any objective answer as to which payments should go through. Some might be invalid, so they all need to be checked. Some might not include any transaction fee, so there also must be a decision as to whether to be nice and allow these free riders to go through or whether to ignore them. Finally, there may be a set of two or more payments such that not all can be simultaneously valid, but certain subsets of it are valid. For example, one wallet might try to spend the same bitcoins twice at the same time. In that case, there is an arbitrary choice over which payments to allow. Thus, for a given set of payments, there may be many possible blocks which can be constructed from them, none of which is objectively the most correct one. There will not necessarily be any agreement over which outcome is preferable because different possible blocks will have different benefits for different people. There is, first of all, the reward that comes from generating a block of a set of new bitcoins. This is necessary because without it there would be little incentive for anyone to do the accounting in the first place; but with a reward available, each miner naturally would prefer the new block to be his proposal rather than anyone else’s. There are other more subtle complications even without considering the reward. A miner might refuse to validate transactions which come from his enemy, or he might be more or less altruistic as to what kinds of fees he will accept. He might even wish to scam someone else by double spending: in this scenario, he would send a payment to a victim in exchange for a good, but would only validate a second conflicting payment he made at the same time to another wallet which he also owns. This would make his first payment invalid, and he would therefore end up with a good he did not pay for. With so many reasons to want to manipulate the block chain for their own purposes, the miners might well agree in the abstract on the need for a consensus without ever agreeing on any concrete proposal. Bitcoin’s solution is to add extra requirements to the protocol which greatly increase the cost of defection. If blocks are generated randomly by a difficult computation, there will be only one proposed new block at a time. Once a new block is proposed, the miners have the choice of continuing to search for an alternative more favorable to themselves or accepting the new proposal and searching for the next one. Everyone who accepts the latest block understands that he is following a natural consensus and that, if he is lucky enough to generate the next block, it will probably be accepted for the same reasons that he accepted the last one. On the other hand, to hold so as to try to produce a more favorable block is very risky because he would have to convince enough of the rest of the miners to go along with him that he can establish a new consensus. 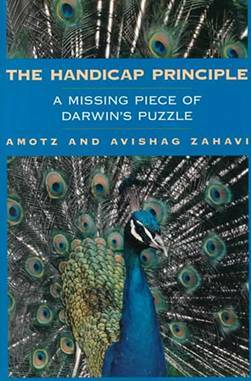 There is an idea from biology called the Handicap Principle which sheds light on this process.5 It says that when two animals have an incentive to cooperate they must communicate good intentions to one another in a believable way. In order to make lying implausible, the signal must impose a cost on the signaler that would make it very costly to cheat. In other words, the signal itself must be a handicap. This can be understood in terms of the Prisoners Dilemma, a famous idea from game theory which has applications to an enormous range of phenomena. The Prisoners Dilemma has two players, each with two options: cooperate or defect. Ordinarily, the game is explained in terms of a story about two prisoners who each has the option of either keeping silent or ratting out the other. The essential features of the Prisoners Dilemma are that each player is better off choosing to defect regardless of the other player’s choice, and that the greatest benefit goes to him who defects when the other cooperates. The players might both be better off if they both cooperate rather than both defect, but since they have no way to ensure cooperation, they will both choose to defect. The Handicap Principle solves the problem of the Prisoners Dilemma by allowing an earlier step to the game in which each player has the option of doing something that convincingly removes the benefit of defection over cooperation. It is hard to think of how to make the Handicap Principle work with the story of the two prisoners, but suppose they have a moment together with the prosecutor and one of the prisoners with a particularly good understanding of game theory says to the prosecutor, “If the other prisoner is guilty, than I am equally guilty.” This statement is a clear cost to himself because it removes his ability to defect when the other prisoner cooperates. The other prisoner then has the option of repeating the statement. If he does not, then he knows that the first prisoners only viable option is to defect, but if he does, then both prisoners can be expected to cooperate. This is the Handicap Principle. The Bitcoin proof-of-work system can be compared to both antlers and altruism. The ability to generate blocks is a show of computational strength, which is just what the Bitcoin network needs to help verify all the transactions. But it is also a show of community spirit because by agreeing to enter the contest for the next block, they show themselves to be willing to respect the interests of the community rather than manipulate the block chain for self-interested purposes. This is just the sort of thing that should be expected to hold a community together. A more recent application of proof-of-work is Bitmessage, which is an anonymous, distributed, encrypted message protocol which could one day be almost as important as Bitcoin.10 It was inspired by Bitcoin, but it works quite differently. There is no block chain in the Bitmessage protocol because there is no need to store all messages forever in a database. Instead, Bitmessage requires everyone who sends a message to perform some work before the network will relay it. This ensures that every message will be meaningful: no spammer could afford to let his computer run for a minute or so for every message he sends. Proof-of-work is essential because a distributed network that relies on computation donated by its users cannot afford to allow free-riders. It is in its early stages presently and it has not yet been studied sufficiently to be considered secure, but it has enormous potential as an alternative to e-mail. A discussion of proof-of-work would not be complete without a discussion of PPCoin, the third most popular crypto-currency after Bitcoin and Litecoin.11 PPCoin also uses proof-of-work so as to make defection unprofitable, but the costs are distributed very differently among the miners: those miners who have held a lot of PPCoin for a long time suffer much less stringent requirements for producing a block than those who have held few PPCoin and who have held them for a shorter time. This means that people will not tend to follow the consensus proposed by the person with the most powerful computer, but rather the person who has demonstrated the greatest investment in the currency. Miners are distinguished by something more like seniority than strength. When a miner creates a new block in the PPcoin block chain, he has to trade in some of his old coins to get the new ones—meaning that everyone who creates a block is less able to create the next one. This system is called proof-of-stake. Proof-of-work and proof-of-stake have different costs and benefits under different circumstances. According to the Handicap Principle, the costs imposed to produce a signal must be related to the meaning of the message. A proof-of-stake system demonstrates investment in the coin itself whereas a proof-of-work system in the underlying network. Thus, if there were a proof-of-work network and a proof-of-stake network which both had the same market cap, one would therefore expect the proof-of-work coin to have a bigger network with a higher capacity and to be more liquid than the proof-of-stake network whereas the proof-of-stake coin would have the greater price stability. The proof-of-work system discourages an antisocial miners from manipulating the block chain by making it difficult to rely consistently on the network to accept his blocks. The proof-of-stake system, by contrast, discourages antisocial miners by accepting only blocks from miners who have an incentive to ensure that the commodity remains absolutely trustworthy. Because the proof-of-stake is used up as new blocks are generated, there is continual turnover in who is able to mine, and thus less incentive to specialize in maintaining the block chain. In its early stages, a crypto-currency network requires long-term investment in the coin itself so as to gain credibility and value, whereas a larger, more mature network would be more likely to require specialization in the network infrastructure to ensure that it functioned properly. This is an academic discussion. It is counterproductive to back any cryptocurrency other than Bitcoin. It is not to be expected that ordinary consumers would choose one currency over anther because of obscure technical details that do not affect their use for it as a currency. They will be much more likely to choose whichever is more widely accepted. Someone who thinks PPCoin is more rational has little expectation of PPcoin beating Bitcoin, but he might have a chance of convincing the Bitcoin community to adapt a proof-of-stake system in some future version of Bitcoin. Although this is theoretically possible and might have benefits, the Bitcoin miners already form a vested interest in the present system and would therefore tend to oppose such an innovation. A world-class mathematician conjectured for superficial reasons to be the creator of Bitcoin by Ted Nelson. He is known both for purported proof of the abc/Oesterlé-Masser-Szpiro conjecture and for his reluctance to advertise his work or to explain it to anybody. The proof is over 500 pages long and so original that no other mathematician yet fully understands it; if it were true, it would be a much bigger deal than the proof of Fermat’s Last Theorem. See his website Mochizuki, S., “Inter-Universal Geometer: Shinichi Mochizuki”, 2013. However, there is no reason to expect the creator of Bitcoin to be a math genius. Bitcoin is a brilliant work of engineering, not of logical deduction. The mathematics required to create it might be found in an introductory cryptography course. Satoshi did not come up with any fundamentally new ideas; he simply put some existing ideas together in an extraordinarily useful new way. This is a hypothetical scenario to make a point. I believe I mentioned that the prisoner’s scenario doesn’t work that well for it. This is an excellent piece on proof of work and the Handicap Principle. Thanks!